For a few weeks we've been struggling with Bubba's behaviour, she can fly off the handle without warning and her favourite word is 'no' on repeat and without pausing. It gets infuriating and upsetting all at once and we haven't been able to move on from it. It came to a head at the weekend, I felt I was loosing myself and the bond with my girl, there was shouting on all sides and it felt horrible. So I did what all good mothers should do, I went on a cake date with one of my besties and she helped me sort through the muddle and suggested lots of things to break the cycle. I had only had three hours sleep as both children had been up at the same time screaming, I'd had a crying fit myself and the husband was out drinking so wasn't about to help us all. 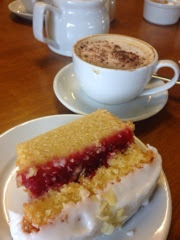 So cake was the only option for me alongside a cappuccino and it helped immensely. 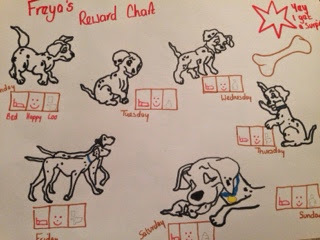 The biggest suggestion my friend had was to use a reward chart, although we have tried these before (we never really needed to do one properly until now) as my girl may be strong willed but she is still fairly laid back and could be talked around. So that night whilst still high on sugar and caffeine, I whipped up a dog related reward chart, dug out some special stickers and we were off. The girl likes dogs and is convinced she will be getting a dog for Christmas (she's not) so it had to be Dalmatians. I did it so each day for a week she will need to get three stars and at the end of the week she gets a surprise. The surprise isn't actually a surprise anymore as I told her we will go to Build a Bear factory and get her Clarice the Reindeer (which I was going to get anyway for me...err I mean her). So each night she has to stay in bed or if she wakes then she has to go straight back to bed (last week she had been refusing to do this and instead sat at her gate moaning and whining to go downstairs usually around 2am...joy! ), the second star is to be happy, she has to stop refusing to do everything I ask of her and to stay calm, third star is earned if she goes to toilet in the morning and evening - the girl can seriously hold her wee and won't go on waking up (sometimes waiting until about 10am before she goes). So far so good, she has risen to the challenge and earned all three stars on the first day, although we had a few issues at times. I feel more positive already and got on really well with Bubba which was a blessing, the week can and probably will bring lots of challenges but so far so good. The morale of the story is that when you don't know what to do or whether you can carry on, go out with a friend, forget the diet and just eat cake. The answers will present themselves and if they don't well you've still had some lovely cake and a good natter. Whatever the struggle, where ever you are, just look into the shadows as I'll be there. I'll be ready to hold your hand, stroke your hair and tell you that you are and always will be loved. When life seems too hard and you can't make sense of things. Look to the skies, I'll be there lighting your way, showing you the silver linings and making stars twinkle for you. If all you can see are clouds, rain and puddles, hold out your arms. I'll keep you dry, hold your hand to jump in puddles and remind you that day turns to night turns to day. What seems bleak now will soon be gone to be replaced by blue sky again. When you get scared of the dark, let me be the light that guides you. Remember strength and peace come from within, I will always give you my strength, my peace and my life. You will never be alone. When you arrived in this world, a piece of my heart stayed within you and you, in turn, fill my whole heart with love. Whatever passes our way, I will try my hardest to protect you, make you feel loved and remind you how special you are. I'll endeavour to be there no matter what and every day I feel lucky and blessed to know you and to be your mummy. This year I spent a rare day alone (without kids) at Mumsnet Blogfest. Obviously I wasn't alone but in a throng of over 300 bloggers and boy can they talk! On arrival there was a queue to get in which added to the anticipation and nerves, after stalling until the last minute I'd only booked my tickets a few days before. 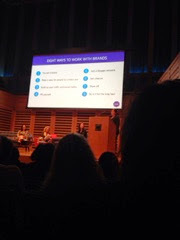 Having also been to Britmums live (last year), I found arriving a lot less intimidating mostly because the venue is more sprawling and you don't walk directly into a wall of women (& a smattering of men) instead you glide down an escalator which helps acclimatise you. The facilities and staff were great and from a delegate point of view it all ran smoothly. The main hall didn't feel over stuffed and the seats were comfy. There was always someone on hand to take your glass away or direct you towards the next destination. The programme had a mix of brilliant speakers and experts but the subject matter stayed at high level. This is no bad thing but I found Britmums had more sessions and they delved deeper, I'm at the stage where I need the nitty gritty of how and why rather than a general overview. The people I met where lovely and interesting. I'm fairly introvert so I was very nervous. My best advice is to just go and sit next to people in sessions. I had some of the best conversations like this. There is nothing worse than sitting two seats away from someone and then another person leaving a gap - suddenly you become an island! I'd definitely recommend this conference to a newbie as it's a great way to meet people, learn some things and see what all the fuss is about without loosing your mind on the way. My only grumble would be (and it's so minor it doesn't really matter) having the lights up a bit whilst a session was under way because for anyone taking notes, it was slightly more difficult in the dark. My favourites from the day were the lovely Tara from The Sticky Fingers blog as she gave great advice on how to tailor your blog if you want to make money. Paul Armstrong spoke quickly, provided lots of information and its the second time I've seen him speak and it's always informative. The Keynote speaker and panel debates were really interesting to listen to and helped motivate me. All in all a great day and I'd highly recommend going. I'm not sure whether I will return next year but that's more to do with me than the conference, I find it really difficult coming away from events like this. You get the high of attending and seeing like minded people all together but this also leads (for me anyway) to a sense of what is it all about! I can't help but compare myself to others and see them doing better/more imaginative/more readers/better photographs...on and on the list goes and I get a bit numb and don't want to carry on writing. I know that on a Monday morning you just about manage to leave the house after locating lost PE kits and stuffing packed lunches but please spare a thought for us newbies. I too have struggled with convincing my three year old that yes she does need to wear trousers and not a fairy tutu. With lack of sleep and a moaning (teething) 6 month old, I too am in no mood to be doing this. What would help enormously would be you not standing like a gaggle of geese right in the way of the nursery entrance. Yes I'm aware that your child also goes into the entrance next to ours but that's not until my baby is safely playing in her classroom. We have to run the shecain of older siblings running into our way, book bags being swung and hitting my kids head (yes her head and thanks SRM for not even apologising on behalf of your errant child). 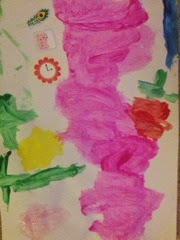 My preschooler doesn't need much convincing that she shouldn't be going in and this becomes her main evidence. Again, I'm aware a lot of you nursery SRM's have older children and don't need to make any more mum friends or particularly want to stop and chat but we are new to all this and a bit eager. It's upset me in the four weeks we've been doing the school run that people aren't pleasant, you don't even smile or nod hello. Our children are all in the same class and I was always brought up to be polite. Surely a smile isn't too difficult. As you may be aware, my new tactic is to smile broadly and say hi to you, especially those of you who avert your gaze (Ffs! what is that all about?). I may come across as manic but it helps me when I'm feeling isolated by you in your little mum coven. Oh and as we walk out of the playground again it would be fantastic if your three children don't take up the whole pavement, making me wait for you all to pass. Then no one has the courtesy of thanking me (again a nod and a smile would be fine instead). Sorry to go on a bit but we are new to this, I love the idea that my girl gets to go to this lovely school and all that entails. As I mentioned, we are a bit keen so I'll probably be one of the offenders this time next week.